“This training base has a unique significance for us because it is a concrete step taken toward building an inclusive and integrated Somali National Army,” said Khaire. 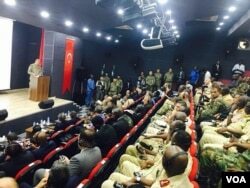 "My government and our Somali people will not forget this huge help by our Turkish brothers. This academy will help us train more troops." Hulusi Akar, the Turkish Army chief said, “the Turkish government would continue to support our Somali brothers until their country becomes militarily stronger." “The good news is not only the opening of this training base but also ...that when Turkey trains our troops it will also equip them,” said Somali Military Chief, Ahmed Mohamed Jimale.